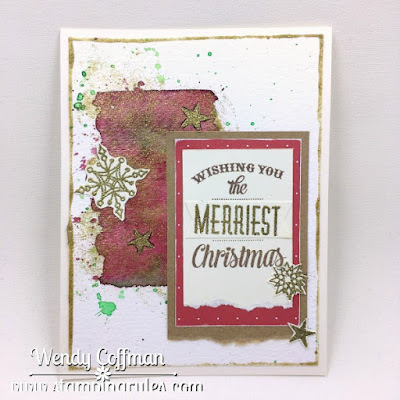 This card is based on the new sketch over at Atlantic Hearts Sketch Challenge. I painted a panel of watercolor paper with wine and green paints. Then I sponged on some Extreme Glitter acrylic paint in gold. I layered on some Kraft CS and Enchantment Fundamentals. I stamped my sentiment (shh! That set is retired.) and embossed the MERRIEST word with gold glitter embossing powder. Stars and snowflakes were stamped and embossed using that same glittery powder. 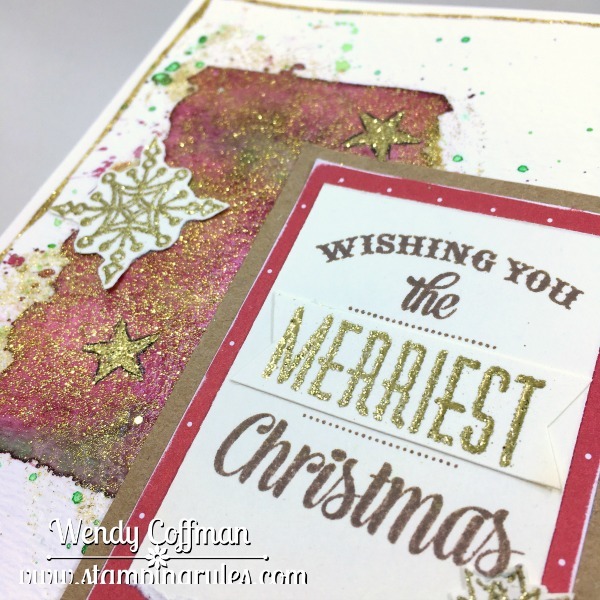 It's not the cleanest embossed look, but it sparkles so in the light! I ran some of that glitter acrylic paint around the edges of my card front before I glued it all together. My hands are a glittery, painty mess, but my heart is happy. Looks like you put in some effort into making this card. However, the end result is pretty nice, and I especially like how cleverly you used the glitter.